Properties in Alfoz de Burgos average 4.4 out of 5 stars. 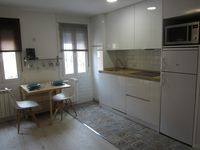 Property 23: Tourist housing in the center of Burgos, comfortable and flirtatious. Rural house (Entire property) El Rincón de Atapuerca. Ideal for groups. Property 30: Rural house (Entire property) El Rincón de Atapuerca. Ideal for groups. Great location, very comfortable bed, excellent host. Don't miss it! The apartment was clean and comfortable. There is free on street parking. Great location - 10 minute pleasant walk to all the main sites. Owners were responsive and very helpful. For us, the only drawback was that the upstairs neighbors were quite noisy quite late. Earplugs could be the solution.